Compact Cherry Laurel is the perfect specimen for creating a smaller evergreen hedge or privacy screen. Evergreen, medium to dark green foliage gives it year round interest that adds value to any landscape setting. Cherry laurel gets its common name from the scent of its leaves when crushed. Though they smell delicious, they are in fact caustic and not edible. Small creamy white flowers emerge in the spring and are sought after by bees and other pollinators. The flowers produce deep black fruit in the fall that wildlife can enjoy, but should not eaten by people. Grow this shrub in full to part sun for best performance; however plants often tolerate more shade in hot climates. Native to East Texas, cherry laurels in general thrive in areas with acidic soils and regular rainfall. However, they also tolerates heat, wind, and drought very well, making them versatile plants. 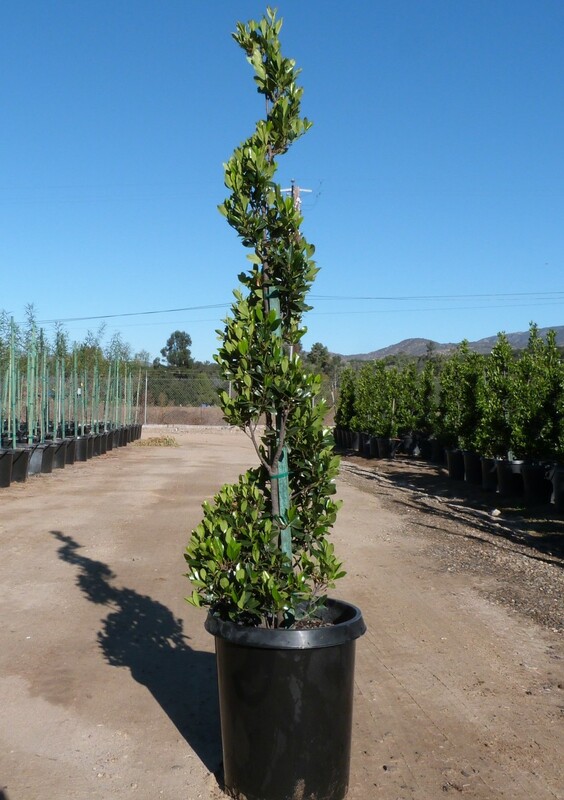 Compact cherry laurel is a more compact cultivar that typically reaches only 10’-12’ feet tall and about 8’ wide; considerably smaller than the standard species. Plants can be sheared to create a somewhat compact conical form, or simply tip pruned in a more natural growth habit.